Forbes has a few thousand contributors (i.e. unpaid writers) who write for their publication for free. There are tens of thousands more who want to write for Forbes, who would even pay to write for Forbes, but have been rejected. During the next 12 months Forbes will likely receive several thousand applications from aspiring contributors, and all but a few hundred will be sent packing. If you’re trying to get in as a contributor to Inc., Entrepreneur, Business Insider, Fast Company, Mashable, HuffPost, Fortune, WSJ, HBR, or the many others out there you face similar challenges. One reason many writers get rejected is because they don’t have a website. 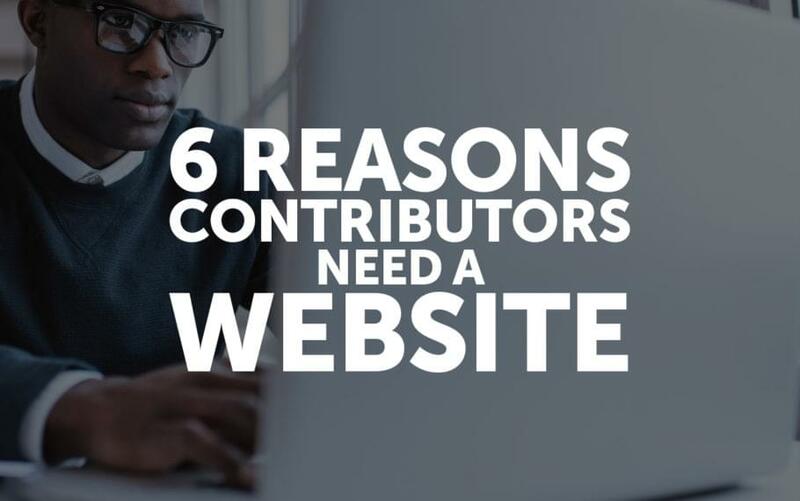 Q: Can you get into Forbes as a contributor without a website? A: Yes, and you can also become a piano player without arms, but c’mon. Look professional. If you have a website that markets yourself as a writer then it looks like you take writing seriously. If you don’t have a website the editor you’re pitching doesn’t know if you just got the idea to become a writer yesterday. It’s one more data point to separate the professionals from the amateurs and build credibility. Chirag Kulkarni, founder of the content marketing agency Taco, says “I sent a cold email to Arianna Huffington with articles from my blog. She invited me to write for The Huffington Post. From there, I got introductions through contributors at various publications.” Do you think it would have been that easy for Chirag if he had sent links to his writing on LinkedIn or Medium? Would Arianna have taken him as seriously? Show off your writing. Sure, you can post your writing on Medium and LinkedIn, and you can even become successful that way, but it will feel different to you when it’s on your own website, and it will look different to an editor as well. It also makes it easier for others to share your work. When I was introduced to my editor at Forbes by my friend Cheryl Snapp Conner he said “Cheryl sent me to your blog. I love what you’re writing there, I want you to write the same stuff, but for Forbes.” Would Cheryl have shared my content if she had to go searching for it somewhere else? You can also do a better job of optimizing your content for search engines and make sure it shows up where you want it to online. Display your achievements. Have you won awards or recognition? Have you written for a bunch of publications? Having a website gives you a place to show them off. Demonstrate your focus. When you pitch yourself as a contributor you pitch yourself as an expert on a certain topic, not merely a great writer. If your website matches your area of focus, it strengthens your pitch by showing your commitment to your topic. If you’re not sure what “your topic” is, download my checklist to create your personal brand tagline. Practice your craft. Your website is your home, your studio, your workshop. If you post on another website, you’re building your platform on rented land that could be taken away at any time. It’s like making improvements to an apartment you’re renting vs one you own. To get good practice in, own your space. Build an audience. You need to build an email list (I recommend ConvertKit–that’s how you signed up for this email and how it’s being sent to you). If you have an email list you can use that in your pitch to an editor at Forbes or any other publication. It’s easiest to build your email list on your own website, rather than someone else’s. Wix? Mmm, maybe, but it’s not my first choice. I don’t know any pros who use it. WordPress? Yes. 25% of the websites in the entire world use it, including everyone I know. The challenge with WordPress is that it’s not exactly the type of thing you want to do yourself. Can you? Yes. Will it take a ton of time and leave you wishing you had paid someone else to do it? Yes. You could hire my agency to build it for you, but then you’re looking at a $15K job. It will be awesome, and be done the right way (like my website), but I know that’s not the right price point for everyone. If you’re somewhere in between $15K and Wix pricing, I recommend you ask around and talk to friends of yours with nice websites and ask them who built it for them. Maybe you can find a great deal with an up and coming freelancer. Regardless of how you do it, make it happen. The faster you get that website up and running and start building an email list, the faster you’ll have the assets you need to successfully pitch yourself and get into a contributor position at Forbes or another publication of your choice.